Note: This article, co-authored with Sprinklr SVP of Strategy and Services Scott Doniger, originally appeared on Pivot Conference's blog. SoLoMo, the term KPCB's John Doerr coined a few years ago, has been used to define the convergence of social, local, and mobile technologies. The promise of SoLoMo for brick-and-mortar retailers was often described as a silver bullet with which always-on, ultra-connected consumers could be targeted, reached, engaged, sold to, and activated as advocates. This promise, often rallied by consumer web apps, has not been fully fulfilled. Experimentation with apps like Foursquare, Gowalla (RIP), Shopkick, and QR code readers has resulted in interesting executions… but few have driven business metrics like awareness, preference, traffic, and sales. Despite marketer skepticism around the SoLoMo buzzword, these technologies are at the center of innovation in the consumer web. Google is perhaps the best example of the convergence of SoLoMo. From Android, Google+, and Google Now to acquisitions like Zagat, Milk, and most recently, Waze, Google wants to be everywhere we are (including our future self-driving cars). Facebook, the world’s leading social network, has proved over the past year that mobile is a top priority. Twitter, which has always been a “mobile first” social service, will likely enhance its local ad targeting capabilities as it prepares itself to be a public company. Newer startups like Highlight, Path, NextDoor, and Tinder are but a few examples of what’s happening in the SoLoMo consumer web. SoLoMo is not a formula or a particular set of tactical executions, and it was a mistake to see it as such. The focus should be on how these technologies are changing consumer behavior, and on instituting a holistic multichannel strategy that puts the customer at the center of the experience. Most Internet users are now using SoLoMo on a daily basis, whether they realize it or not. Retailer strategies need to be crafted around this new reality. The context in which people are experiencing brands and products is very different from what it was just half a decade ago. The basic elements of the infrastructure “backbone” required to deliver seamless SoLoMo experiences today are basically everywhere. For example: the number of public spaces where Wi-Fi isn’t enabled continues to shrink. With so much interconnectedness, and data transfer and transmission now easily available, the consumer journey is becoming increasingly complex. Yesterday’s Foursquare and Gowalla users may be using Tinder, Path, NextDoor, and Highlight in the near future. Does that mean retailers should partner with these newer startups? Perhaps, but that is not the point. The key is in understanding what the new consumer path to purchase means for your business, and what role the mashup of location-aware, socially connected, mobile experiences play in this new regime. SoLoMo is more than a means to reach customers — it’s a way to better understand and satisfy them. "A lot of people — including myself — get excited when an agency says that a marketing campaign should start with social. But what does that really mean? Starting with social means understanding how your customer engages with your store at a microscopic level. What do they like? What do they find annoying? How do they respond to your content and how do they talk to their friends about it?" (34). "Our analysis shows the importance of actually talking to your customers to find out how they use social and mobile, not only in general, but in terms of their specific path to purchase for your store, product or product category (in-store, as well as out-of-store). There are huge variations across different product categories — for example, people who share and then buy electronics items are much more likely to be thinking about that purchase even before sharing, while people who are making food and drink purchases are much more likely to be sharing and then buying items they had not previously contemplated. Understanding those kinds of differences allows a retailer to develop a strategy focused on triggering new sales, and ensuring that consumers move from sharing to purchasing in the timeline during which most socially-shared purchases are made —about half within one week of sharing, and 80% within three weeks. For example, retailers of products with a high transaction value per purchase may want to reach out to people who have shared their products to encourage purchase. There is much we don’t know and can’t predict. For now, the lesson for brick-and-mortar retailers is that SoLoMo is real, but it’s also a work in progress. We know SoLoMo is about technology, but many of the technological questions have been answered — we know people everywhere will be digitally connected by great numbers and more innovative, capable devices; we know bandwidth will become more pervasive; we know connectivity will extend more robustly in urban centers and expand to rural and remote regions. But the change retailers must plan for goes beyond technology. SoLoMo has become native to human experience. As such, it must become a business mindset. It must become required thinking for every retailer. Vision Critical’s research uncovered new insight into how Pinterest is driving retail activity, concluding that “showrooming,” the bane of brick-and-mortar retailers, is as prevalent as “reverse showrooming,” where consumers are actually using Pinterest to shop offline and purchase in-store. Both of these phenomena are threats AND opportunities for retailers. Automated (offline) shopping is becoming a reality in more ways than one. 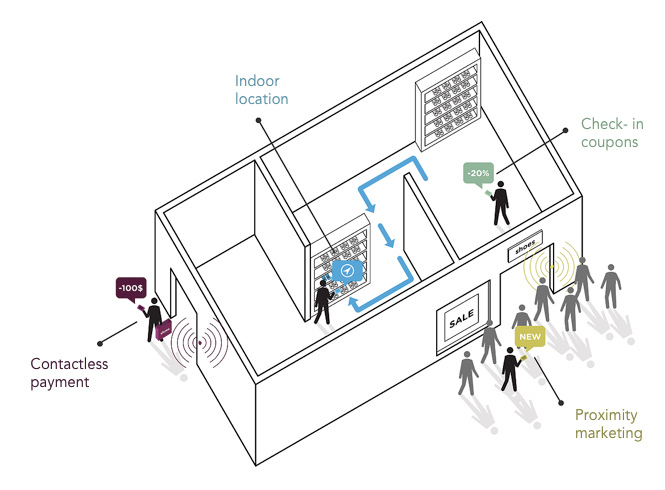 NFC, Apple’s new iBeacon and other sensor technologies (e.g. Estimote) will facilitate new kinds of contextual interactions with customers in the near future — from proximity marketing and contactless payments, to personalization systems that learn over time. Seattle-based company Hointer already has a retail showroom where the entire experience — from checking inventory levels to getting a fitting room and self-checkout — is carried out via mobile app. TeamLabHanger creates virtual mannequins powered by hangers — grab a hanger with a shirt you like, and the digital signage around you is personalized so you can learn more about the item. Virtual stores, an idea popularized by Tesco’s Homeplus Subway Virtual Store in South Korea, are now popping up in major cities. eBay’s Retail Innovation team created four pop-up 24/7 “shoppable windows” for Kate Spade, allowing visitors to purchase on a touch screen and get items shipped home within an hour. If that’s not enough, imagine the effect that robotics would have in retail settings. This may sound far-fetched today, but consider that overall confidence in VC investing in the robotics sector is higher than that of energy/clean technologies, according to Deloitte’s 2013 Global Venture Capital Confidence Survey Results. Retailers bold enough to explore, experiment, and invent new mobile apps, interactive POS systems that are integrated with social CRM systems or location-agnostic and device-agnostic payment systems, for example, will likely remain as leaders and the first to win. While the basic, fundamental objective for retailers will never change — it’s ultimately about satisfying consumer needs and wants. For new generations of digitally savvy, socially connected and empowered natives, however, SoLoMo we know today are the “table stakes” of future engagement relationships. Offline and online strategies must be integrated and consistently optimized. Loyalty programs must become synchronous with in-store recognition technologies. Customer-staff interactions must become personalized in a valuable and frictionless manner. One bad experience can end a lifelong customer relationship, while a great one could be the source of exponentially greater lifetime value. The term “SoLoMo” may be short-lived — just another buzzword we will toss out the window — but the fundamental shift in how we use technology matters to retailers because it creates new opportunities (and threats) for customer relationships. A multichannel marketing strategy that doesn’t add value to the consumer is utterly useless outside of boardrooms and office conference rooms. Focusing on the consumer is the first step to earning sustainable attention, trust and loyalty. In a follow-up article, we’ll share four aspects of consumer expectations in a SoLoMo world, as well as immediate and mid-term implications that can help retailers take action.